This example shows how to use analog input channels and analog output channels together with a single Session object running near simultaneous. Use daq.createSession to create a session. For the purpose of this example use a compactDAQ chassis NI c9172 with NI 9205 (cDAQ1Mod1 - 4 analog input channels) module and NI 9263 (CDAQ1Mod2 - 4 analog output channels) module. Use the daq.getDevices function to get more information about connected hardware. For more information see the Discover NI Devices Using the Session-Based Interface example. In this example the analog output channels are connected back to the analog input channels so that the acquired data is same as the data generated from the analog output channel. Use the addAnalogInputChannel command to add an analog input voltage channel to the session object for acquisition. Use the addAnalogOutputChannel command is used to add an analog output voltage channel to the session for sending data. The Session objects can contain channels of different types in the same object and can be used to start acquisition and generate signals at the same time. No data queued. Will run at 1000 scans/second. The analog output channel you just added shows that no data is queued for the object. This is because analog output channels require data to be queued before the operation is started. 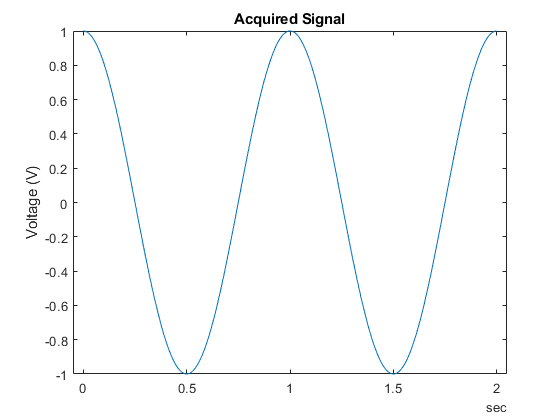 A sine wave signal is generated and queued. Note that for each analog output channel the data is in a separate column. Use the queueOutputData command to queue the data. Once the data is queued, you can start operations in the foreground or background. Foreground operations block MATLAB® until the operations are complete and data is returned. Background operations are non blocking and return control to MATLAB command line processing immediately, allowing other MATLAB code to run in parallel. Use the startForeground command to start operations in the foreground. 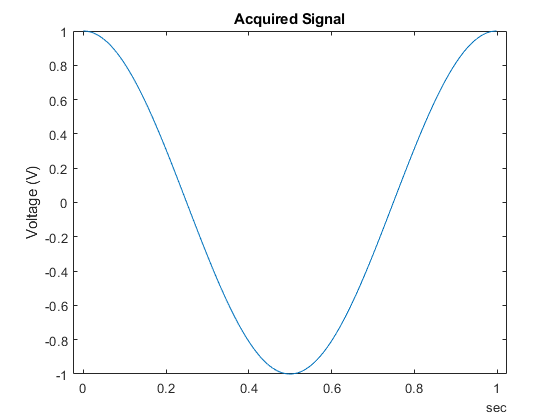 Both generation of signal (analog output) and acquiring of signal (analog input) are synchronized and start together. You can see this from the acquired data being the same as the generated data as the analog output channels are connected back to the analog input channels. Plot the acquired data acquired and see that it is exactly the same as generated data. 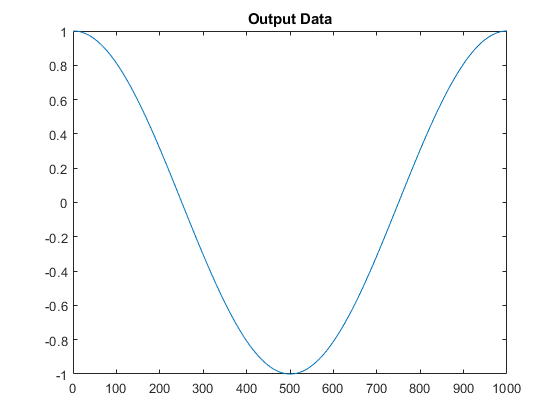 The duration of acquisition depends upon the amount of data queued for the analog output channel. Since both the channels run at the same rate of 1000 scans per second, the duration of operation, after queuing 1000 data points above is 1 second as shown DurationInSeconds. If you queue more data, the duration of operation will change automatically. Use the startForeground command to start the acquisition and the generation simultaneously. Plot the acquired data acquired. It is exactly the same as generated data.